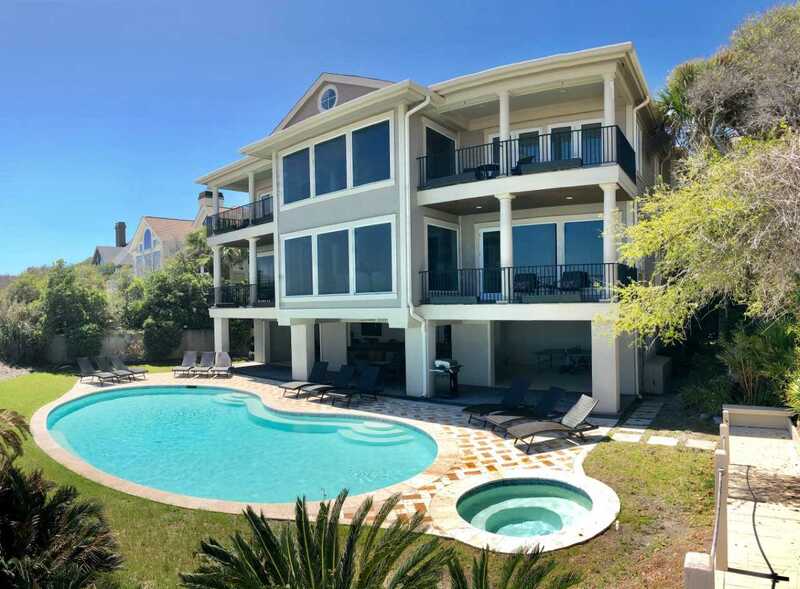 17 Spotted Sandpiper has been added to your favorites! 17 Spotted Sandpiper has been removed from your favorites! 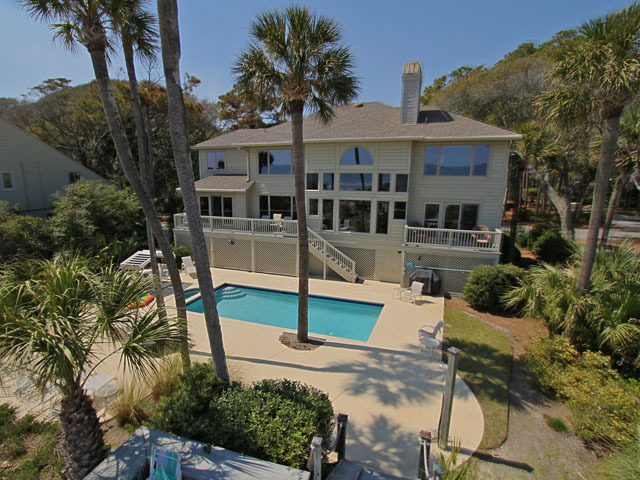 This masterpiece home in Sea Pines has 4 king bedrooms plus media room, sleeps 10 and has 6 bathrooms. refrigerator storage drawers, and an extra wine (or beverage) cooler. Handmade designer chandeliers hang over the two islands and a six burner gas powered range (with a griddle option) and double oven are available. A Plasma TV is hung tastefully in the cabinetry and 4 counter stools are an option for in kitchen dining. This seating is adjacent to the breakfast nook with another table seating for 4. The kitchen's elegant conveniences display the modern features available today. A comfortable spacious plank wood dining table has generous seating for 14. Dining alfresco is also available at a poolside table or at the outdoor bar. Outdoor Grilling or bar tending is available on a large countertop/outdoor kitchen area with a refrigerator and a stainless steel sink. Sweeping views for the chef and barstools on the stone outdoor bar. 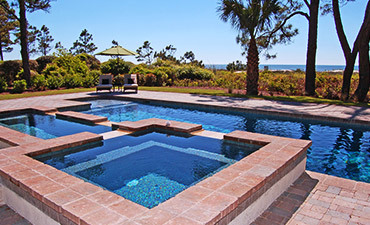 Just behind the bar are 2 luxury outdoor sofas flanking the person hot tub which overlooks the large pool. 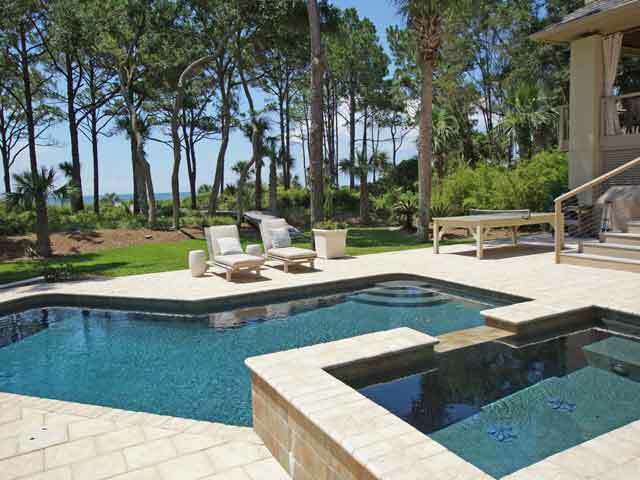 Hot and cold Outdoor shower and footbath are conviently located on the home's private pavered beach walk. This walk is elegantly landscaped leading to a private wooden lanai with wooden bench at the peak of the sand dunes. Outdoor club chairs surrounding a wood burning fire, to finish any chilly evening, or s'mores at sunset. The media room on the second floor also serves as a 5th bedroom featuring two twin beds(set up as sectional sofa in pictures) - suitable for children or an extra guest. The media room has a size movie screen and the room can be darkened by the touch of a button to bring down retractable shades to enhance viewing pleasure. The room has a private half bath, a bar area and is paneled in the homes signature reclaimed wood and custom cabinetry. The master bedroom has 2 French doors opening to the outdoor fireside ensemble, king bed, a plasma TV and a luxury bathroom. A private glass bathing area with 3 shower heads and a soaking tub is available in the master suite. Upstairs green suite offers a king bedroom, TV and private balcony with sweeping views of the Atlantic, large bathroom including artisan tiled tub and a separate large shower. Another upstairs, similar king suite offers an oceanfront patio also and a large bathroom. A bathtub, and separate shower is available. Hallways and main area's cathedral ceilings are also accented throughout with antique reclaimed wood and colorful Lowcountry artworks. **Free shuttle service through Sea Pines Trolley available March through September. *Please note, this house is oceanfront and does not require traveling to a beach entry. However, should you wish to use the facilities of the Sea Pines Beach Club please note the following: there is very limited parking at the Sea Pines Beach Club March 23-September 2nd from the hours of 9am to 5pm. 50 parking places are available on a first come- first serve basis. A Free beach shuttle service is offered for beach access – refer to your property information for parking lot locations.